Endodontic surgery encompasses surgical procedures performed to remove the causative agents of periradicular pathosis and to restore the periodontium to a state of biologic and functional health. Endodontic surgery has developed the perception in some areas of dentistry as being an unpredictable and unnecessary procedure, especially with the advent of modern day implants. 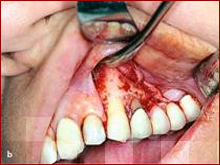 This opinion has been based on endodontic surgery being performed using outdated concepts and techniques that compromised the potential for clinical success, often resulting in the persistence of patient symptoms, periapical pathology, and, ultimately, extraction of the treated tooth.